Carbohydrate Mouth-Rinses Activate Brain Areas Involved in Visual Perception & Reward - Are There Implication For Athletes & Obese Individuals You Need to Know? You know what a "mouth-rinse" is, right? That's when you wash some sort of liquid "through" your mouth and spit it out without swallowing. Over the past years, I have probably read a dozen of papers on this topic and although I did not keep exact record, I am pretty sure that six of them presented positive results (meaning the carbohydrate mouth-rinse increased performance), while the other six reported a null-result (no performance increase). The former is also the main reason I did not address this topic in any previous articles in detail. A couple of days ago, I hit on a study that made me reconsider my previous decision that the contemporary evidence would suggest it's not really worth talking or rather writing about carbohydrate mouth rinses. The study is about to be published in the renowned pee-reviews scientific journal "Appetite" and it is the first study to replace the performance measures (physical or cognitive ones) with neuroimaging... with intriguing results, as I may say. The good old mantra is that you ingest carbs, they are absorbed, your blood glucose levels increases and all sorts of good an bad things happen. In the course of the whole diabesity debate, here at the SuppVersity, you have already learned that this is not just an oversimplification - if it's not seen in perspective, it's simply false. Still, before the publication of the study at hand, we had only little experimental evidence of the impressive downstream effects of sweet taste receptors in the mouth. The data Turner et al. present in their latest paper, appear to confirm that there is in fact a hitherto mostly overlooked energy signalling pathway capable of improving human performance that's triggered by the presence of carbohydrates in the mouth. The scientists from the University of Auckland believe that this pathway may form part of homeostatic energy systems that govern and promote feeding behaviour via the transduction of information specific to energetically-useful nutrients (Sclafani. 2004); and - as mentioned before - this pathway has already been shown to enhance corticomotor output (Gant. 2010) - the data in Figure 1 is only from one of the latest studies. Ok, the results may be inconclusive, and the dependence on exercise duration or other confounding parameters may be under-researcher, but the observed benefits are there. 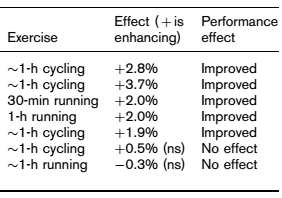 Being in the range of 2-4% they may seem "insignificant" (from a practical perspective, not a statistical one; see Table 1), but 4% more mileage during 1h cycling, that's worlds apart - at least in the in the world of the pro cycling. In short, The ameliorating effects CHO mouth rinses have had on the observed declines in motor function in previous studies was associated with reduced fatigue significant enough to provide a neural basis for enhancements in motor performance observed in many behavioural studies (Jeukendrup. 2010). The protocol of the study at hand is complex, but in essence, it should suffice to know that the subjects, 10 healthy volunteers, had "mouth-rinse" with either carbohydrate (CHO) or - this is important! - a taste-matched placebo (PLA) solution in a double- blind, counterbalanced study. As the scientists point out, "[t]his protocol eliminates post-oral factors and controls for the perceptual qualities of solutions", and guarantees that the functional magnetic resonance imaging of the brain identifies only those cortical areas which are actually responsive to oral carbohydrate during rest and activity phases of a hand -grip motor task. In particular, the scientists measure that the mean blood-oxygen-level dependent signal change experienced in the contralateral primary sensorimotor cortex was larger for CHO compared to PLA during the motor task when contrasted with a control condition. Now what's interesting is that the differences were observed not just in those areas of which we know already that they belong to the primary taste cortex. In fact, another region that was heavily involved in the CHO mouth-rinse response was the area of the brain that's usually responsible to process visual perception, as well as regions deep down in the the limbic system that have been previously associated with reward. The total rinsed/ingested amount of the solution was set at 14 mL/kg body weight and the subjects were instructed to "rinse" equally distributed over the course of the time trial. The actual rinsing lasted for 5s, afterwards the liquid hat to be spit out. The drink that was used was standard Gatoratde with 5.4 g sucrose, 0.46 g glucose, 41.7 mg Na 1 , 12.5 mg K 1 , citric acid, salt, sodium citrate, natural flavor and the other "Gatorade-ish" additives that are in there though no-one wants or needs 'em. Bottom line: The observation of difference in both, the areas that are responsible for visual perception and the reward center are relevant for both, athletes and gymrats who are increased in maximal performance (think of a tennis player who need maximal visual acuity and enough dopamine (reward) to perform!) and overweight individuals. The latter usually don't need a heightened visual acuity, of course. The lack of reward ... or rather their constant struggle for food-rewards on the other hand is a massive problem. In this context the superiority of the CHO vs. the artificially sweetened mouth-rinse shines a whole new light on the "diet products for weight loss debate?" and could rekindle a discussion about the timing of the measurement the dopaminergic / brain / reward response to these foods - the latter could be "instant" and any study measuring the effects in the postprandial phase may miss the most important, immediate, taste-receptor-mediated effects completely. Plus: You want to learn more about artificial sweeteners of food reward, click on the links (RSS compatible browser required)! Gant, Nicholas, Cathy M. Stinear, and Winston D. Byblow. "Carbohydrate in the mouth immediately facilitates motor output." Brain research 1350 (2010): 151-158. Phillips, Shaun M., et al. 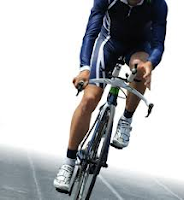 "The Influence of Serial Carbohydrate Mouth Rinsing on Power Output during a Cycle Sprint." 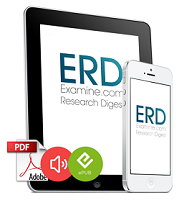 Journal of sports science & medicine 13.2 (2014): 252. Pottier, Andries, et al. "Mouth rinse but not ingestion of a carbohydrate solution improves 1‐h cycle time trial performance." Scandinavian journal of medicine & science in sports 20.1 (2010): 105-111. Sclafani, Anthony. "The sixth taste?." Appetite 43.1 (2004): 1-3. Turner, Clare E., et al. "Carbohydrate in the mouth enhances activation of brain circuitry involved in motor performance and sensory perception." Appetite (2014).